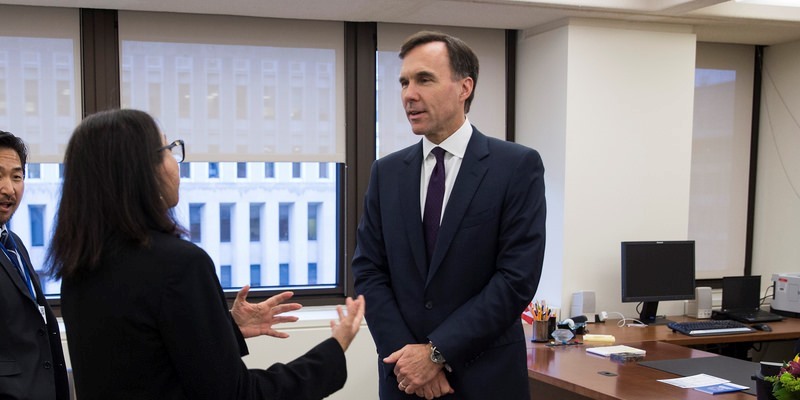 Federal Finance Minister Bill Morneau (pictured above) unveiled the Trudeau government’s economic update on Wednesday, which it had signaled would include measures to address Canada’s lack of competitiveness with the United States. While the update included accelerated capital cost write-off provisions for business, these measures barely scratch the surface of our competitiveness issues. Canada previously enjoyed an overall business tax advantage over the U.S. and our marginal effective tax rate (METR)—a broad measure of tax competitiveness—last year was approximately 21 per cent compared to 34.6 per cent in the U.S. But Congressional Republicans and the Trump administration introduced sweeping tax reform and reduced the U.S. METR on new investment in 2018 to 18.8 per cent, primarily by lowering business tax rates and introducing accelerated depreciation, which is often ignored in reporting on the tax reforms but remains critical since it significantly reduces the burden on business to invest in plants, machinery, equipment and new technologies. Combined with a concerted effort to reduce regulations, these reforms allowed the U.S. to become a much more attractive place for investment. And yet, despite major changes south of the border, Canada increased regulation, maintained our uncompetitive business tax rates and increased personal taxes on entrepreneurs, business owners and investors. Our recent inability to attract investment reflects Canada’s lack of competitiveness. Foreign investment in Canada is down 50.7 per cent since 2014—the year before the government took office. In contrast, Canadian investment abroad has increased by 54.2 per cent since 2014. Furthermore, business investment as a share of GDP dropped from 13.7 per cent in 2014 to 11.6 per cent early this year. Alarmingly, capital appears to be rapidly fleeing Canada. Wednesday’s federal fiscal update did include an important measure that allows higher rates of depreciation to be claimed when firms invest in eligible capital including machinery and equipment. While this measure will make Canada more competitive when it comes to the cost of investing, it’s merely a temporary measure scheduled to be phased out starting in 2024. In addition, the government took no action to lower business tax rates. So while Canada is now more attractive to invest, we’re still not competitive on the results of those investments, which is profitability. Clearly, the Trudeau government should have broadly lowered business tax rates to enhance our competitiveness and boost investment in the economy. Earlier this month, Faisal Kazi, president and CEO of Siemens Canada, met with Prime Minister Trudeau and said our high business tax rates impede his business’ ability to invest more in Canada. Reducing business tax rates would have ultimately stimulated new investment in the economy, leading to job-creation, gains in productivity and ultimately wage growth for Canadian workers. Furthermore, the Trudeau government glossed over Canada’s ever-increasing regulatory challenges, which have made the country a far less-attractive place to do business. Our regulatory systems remain a self-imposed barrier to economic growth due to increasing complexity, unpredictability and the time and costs associated with compliance. For example, Canada now ranks second last out of 35 OECD countries in the average time required for regulatory approval for construction projects. And we have fallen out of the top 20 countries on the Ease of Doing Business Index compiled by the World Bank. In the long-run, the measures introduced Wednesday by Minister Morneau will have a small, perhaps even negligible, impact on our competitiveness. Wide-ranging regulatory and tax reforms were required to actually make meaningful change. Despite all the hype, today’s economic update did not live up to its billing, and we are not much closer to improving our competitiveness than we were yesterday.